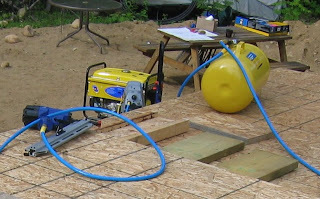 Cottage on the Edge - the DIY Cottage Blog: "Have Air, Can Build..."
Or I could have said "have gun, can build", but I need the air to power the gun, the air nailer to be specific. The air compressor I have is a bit small for serious framing. It is a 11 HP 5 gallon compressor, but I discovered that it has difficulty keeping up with the rapid fire of the nailing gun. After about 5-6 nails, of the 3.5 inch variety, the pump starts up to refill the built in tank (5 gallon). Having the nail driven in for me sure saves on hammer elbow, but having to pause ever so while to allow the pressure in the tank to catch up becomes a bit tiresome. I remedied this problem by adding in series, between the compressor and the nailer, a second air tank which holds about 25 gallon. As it turns out this combination works pretty well. I can now keep going at a fairly good pace. Remember I am not a professional builder so just not quite a quite as the pros. The blue stuff is the air hose.